Although the Yowlumne and Tulumne Yokuts fished the rivers and lakes of the San Joaquin Valley all year long, and hunted deer, rabbit, racoons and other game in the marshes and grass lands, most of their food came from plants, particularly acorns, nuts, seeds, roots, and berries. Women gathered these staples in the Summer and Fall, and because food was plentiful there was no need to farm. If one type of food became scarce with the passing of the seasons, the Yowlumne simply found another. Acorns were an important food for almost all California Indians. Women were the main acorn gatherers, and each Fall they hiked to oak groves in the surrounding foothills, hoping to gather the acorns before oak moths infested the trees. Each woman wore a net on her head that was woven like a cap and hung down her back. From this, she suspended a large conical basket, sometimes called a "burden basket", to be filled with acorns. After collecting, the acorns were placed in the sun to dry, then stored in baskets, sometimes for months at a time. Later, women and children cracked the acorns open with stones to remove the hard shells and smashed the soft "insides" into meal using stone bowls and elongate pounding stones. 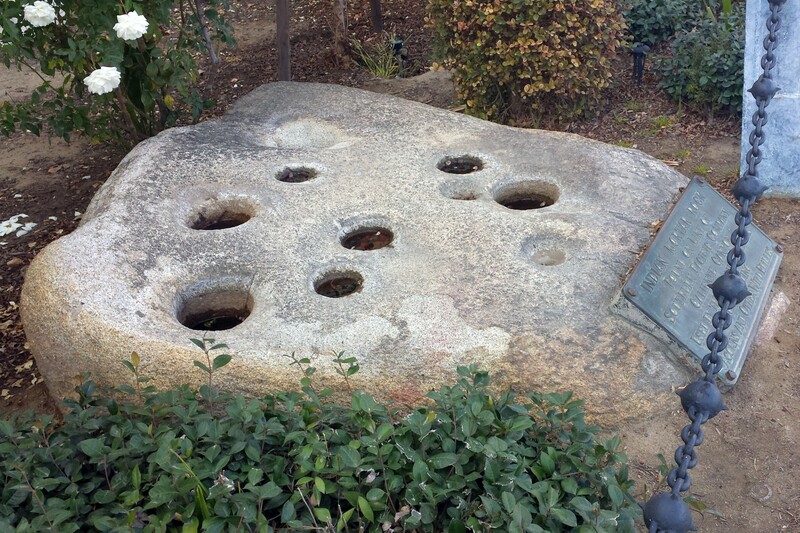 Often this chore was done on boulders, usually near oak trees, using holes in the boulders called "mortars". These holes became deeper and deeper with successive poundings over the years, and eventually needed to be replaced by new mortar holes as the old ones became too deep to use. Needless to say, acorn meal often contained grit, which tended to wear down ones teeth. A bitter acid in the acorns, called tannin, would make one sick, and had to removed before the acorn meal could be eaten. To do this, a hill of sand was made with the center of the hill scooped out and lined with leaves, typically from grapevines. The acorn meal was set on top of the leaves and boiling water poured over this meal several times to leach out the tannin. Another method was to bury the shelled, but otherwise whole acorns, in marshy ground for several months to let the damp soil slowly leach out the acid. To cook acorn meal, women mixed it with water in tightly woven baskets to make a mush and heated the mush with hot stones from the fire. These stones were dropped into baskets using sticks that were bent and tied together with sinew or twine from Yucca fibers to form loops. Constant stirring was required lest the hot stones burn through the bottom of the baskets. The acorn meal could also be made into dough and cooked on hot rocks, or rolled into hard balls to carry on a journey. Pine nuts were another important food of the Yowlumne that was eaten raw or ground into meal. Because the Pinyon (Piñon) Pines from which these nuts were collected grew in the foothills, well above the oak trees, the Yowlumne needed permission from their neighbors the Kawaiisu, Pitanisha or Chumash to collect this staple. However, ancient agreements existed between the tribes, and permission for the harvest was seldom denied. Interestingly, the Pitansha called themselves the Tubatulabal, which in their own language means "pine-nut eaters". Harvesting was done in the Fall, when the small cones were full of pitch and ready to open. Men knocked the cones down from the trees using sticks with willow branches lashed into V-shaped forks on the ends. Women and children gathered the cones in large cone-shaped baskets, suspended these "burdon baskets" on their backs with head nets, and hauled them to temporary camps near the pine groves. Back at camp, the cones were pile high in a fire pit, and roasted on hot coals with frequent turning until the cones popped open, allowing the nuts inside to be shaken free. However, soft brown shells encasing the inner fruit of the nuts still needed to be removed. To do this, the nuts were mixed with some hot coals on flat round baskets called winnowing trays, and both coals and nuts tossed repeatedly into the air with swirling motions. When the shells became hard, crisp and dark brown, the coals were removed, the nuts placed in a stone mortar hole, and pounded with a stone pestle to crack the shells. Some of the cracked nuts - now translucent, soft, yellow-orange and quite delicious - were eaten raw. The rest were returned to the basket trays to winnow out the husks, with repeated tossings and swirlings until the wind carried off the remaining shells. Coals were then added back and roasting repeated until the nuts became dry, hard, and somewhat darker than before. The nuts could now be stored in large above-ground storage baskets for later use, provided squirels and other vermin didn't get to the baskets first. Some of the dried nuts were eaten raw, but most were ground into flour using an elongate rolling stone called a "mano" on a flat grinding stone known as a "metate". When enough flour was available, it was added to water and the mixture warmed by dropping hot stones in it to make a thick, pine-nut mush that was bit bland on its own, but became quite a feast when berries, roots, leaves, and possibly some chopped meat or fish were added. Tule Grass, field grasses, sage and other bushes provided seeds that could be ground or eaten raw. Grass seeds were collected in the Fall using flat baskets, called seed beaters, which scooped the tops of grasses to strip off the seeds. A type of sage brush called chia produced an oily, but very tasty seed, that was collected in the summer. Mesquite bushes produced long, pod-like beans that were also collected in summer, when the pods were still green. The pods were dried, stored like acorns in baskets, then ground in stone bowls for mush, baking dough, or mixed with water to make a drink. Other seeds were usually ground into flour using the stone "manos" and "metates" we described above. There were also tubers and roots from tule grass, cattails, and dandelions that were edible, as well as berries from manzanita, junipers, and the red Toyon (Christmas) berries. All could be eaten raw or ground up and seeped in boiling water for tea. Fish and game provided variety, but were supplements, not staples, of the Yokuts diet. Almost anything that moved was fair game, but not coyote or grizzly bear as they were sacred. Small fresh-water clams that proliferate on the banks of the Kern River were collected, and crayfish caught in baited traps. Grasshoppers that later plagued white settlers were harvested by the Yokuts in the late summer, and when toasted provided a tasty treat. Indeed, the valley provided many delicacies, and though life for the Yokuts was hard, food was seldom scarce.